Directors’ and officers’ liability insurance was at one time considered essential only for large public corporations. Now, no public limited company anywhere in the world should be without it. Large private companies, charities, financial institutions, pension funds and all executive directors need to consider the risks. It is a widely held isconception that legal action cannot be taken against individual directors of limited liability companies. Directors’ and officers’ liability insurance is one of the fastest growing areas in the world insurance market. Company directors are facing increasingly onerous resonsibilities as shareholders demand higher standards of corporate governence. Recent years have seen more stringent laws on environmental liability and directorial responsibility for pollution is now a global concern. Just what are the personal liability risks facing directors? How can they protect themselves against the increasing possibility of being sued? Ian Youngman cuts through the jargon and explains the intricacies of this kind of cover and how it relates to other forms of insurance. He includes examples of claims, as well as profiles of insurers specialising in this area. He also assesses the current and likely future status of D & O cover in all the world markets. 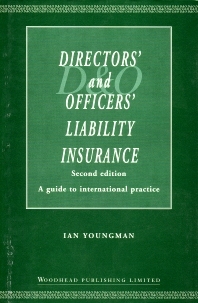 The need; The cover; Links with other insurances; Variations; Pension trustee; Non-profit institutions; Environmental; Relationship to company law – UK; Relationship to company law – USA; Claims examples – UK; Claims examples – USA; The marketing of D&O liability insurance; Underwriting; D&O liability insurance in the USA; D&O liability insurance in the UK; D&O liability insurance in the Europe; D&O liability insurance elsewhere in the world; International covers.